This 8in mag mount is an excellent way to mount a portable CMM arm or laser tracker on a ferrous surface like a steel plate or table. 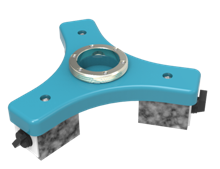 Some customers use them as a very flexible mounting solution on a large steel table or even mount them directly on the bed of a machine tool. 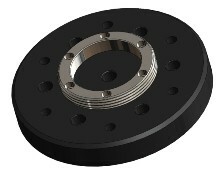 They are easy to turn on and off so a user can quickly use one to move around while measuring a large part on a table. The magnets are turned on and off using a hex key allen wrench. In some cases customers even use a mag mount to put the portable CMM right on the part being measured. This creates a desirable situation where the part will not move relative to your measurement device. 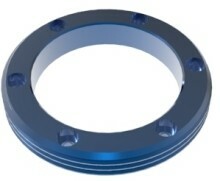 Our circular magnetic mounts come in three sizes 6in, 8in and 10in. We recommend the 8in version for all portable measurment CMM arms like those produced by FARO, Hexagon / Romer, Kroeon, Nikon, etc. over to 12ft long. We also recommend the 8in magnetic mount for the latest smaller generation of laser trackers like the FARO Vantage S and FARO Vantage E, API Raidan, API Omnitrac 2, API OT2 Core, Hexagon / Leica 401,402,403, and the Hexagon/ Leica 930 and 960 in instances where a customer has a unique situation where they want to mount a laser tracker horizontally on a wall or upside down. For older versions of the laser tracker like the Leica 902 or the FARO blue body laser trackers like the Ion, Xi, X, Si and I models we always recommend the 8in version. Our magnetic mounts include a stainless steel 3-1/2″-8 mounting ring that is universal. The magnetic mounts come in a hard case with custom foam to ensure that they are easy to transport to the work site. We also offer adapters for the 3-1/2″-8 ring for customers needing to use the magnetic mount with a 5/8″ thread for a laser scanner or tribrach as an example. 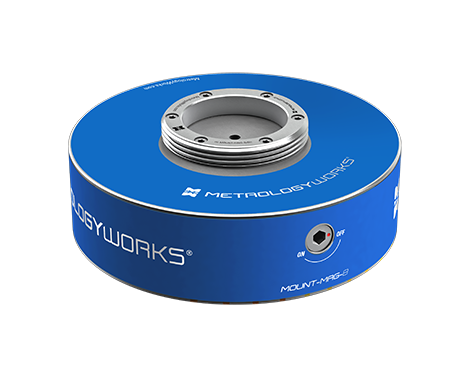 In all cases we have you covered if you need to mount a portable CMM to magnetic surface.